Neon District, one of the most hotly anticipated blockchain gaming platforms built on Ethereum and Loom network, has an ongoing registration for ‘Founder Key’. You can sign up for free here, only for the next 2 days. By signing up, you not only show an interest in Neon District, but will also get some really cool exclusive in-game assets. In addition, Founder Key holders will get exclusive early access and access to Founders Sale as well. 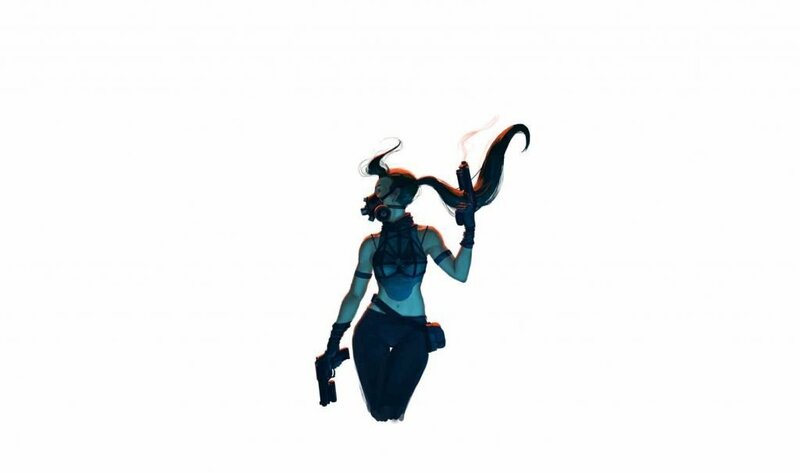 Neon District is created by the famous Marguerite deCourcelle, aka Coin Artist (coin_artist) who is well known in the broader blockchain and crypto community for her intriguing puzzles that can be solved to unlock Bitcoin or crypto. Neon District is already valued at $13 million, with investments from the likes of investors like Ari Paul, who have raised hundreds of millions of dollars during the peak crypto boom of 2017. Blockchain gaming is becoming increasingly complex and competitive, and serious game builders and developers are finding a home in this space. Blockchain native games with minimal gameplay like CryptoKitties have shown a proof of concept of what is possible. Games like Neon District are taking it to the next step. There are of course several advantages of putting in-game assets on the blockchain. Interoperability with third-party applications, for example, is a huge one. Another is the aspect of ownership – even Neon District cannot arbitrarily stop you from trading your asset or selling it, so it represents property ownership rights as closely as possible, similar to the ‘real world’. There are of course challenges like scalability. Neon District is using a Plasma Chain to build its app and make transactions, using the Loom Network. Loom has become the chain of choice for these types of games as it provides developer tools and onboarding for new games. Get your Founder Key – for Free! With this background in mind, all gamers and blockchain enthusiasts should sign up for Neon District’s Founder Key, over the next 2 days. It is free currently, and you’ll get some cool in-game assets to boast or sell. After all, it’s yours on the blockchain, and you can always sell it to buyers and game enthusiasts down the road! 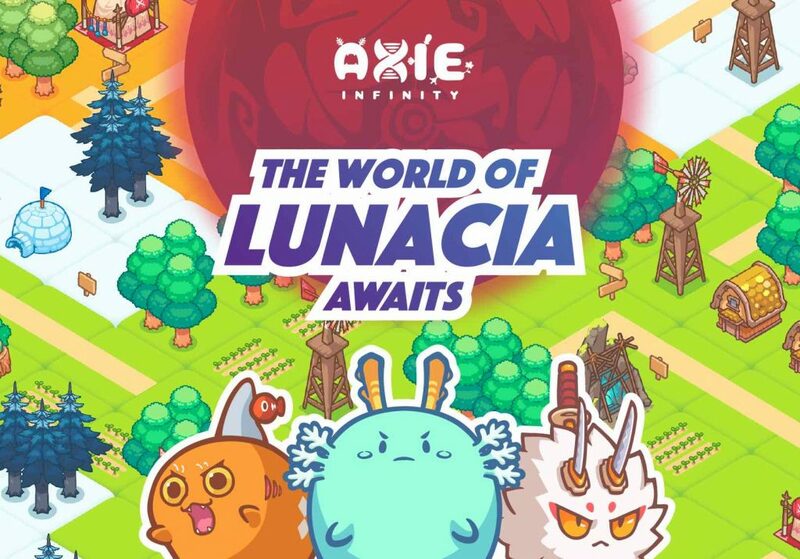 Axie Infinity one of the top blockchain-based games, launched the sale of parcels of land within its online virtual world, Lunacia. 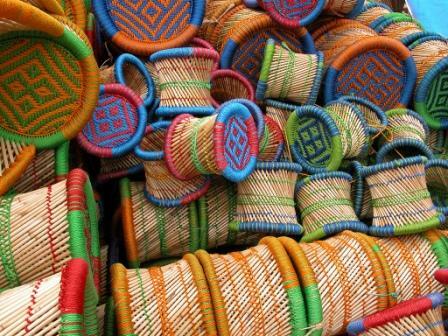 The total plots of land are limited, making them a highly sought after collectible and gaming item. The company opened the sale of 25% of the total land in Lunacia, with future sales planned for the rest of the year. The land in Axie Infinity’s Lunacia is based on the ERC721 standard, which has become the default standard for issuing non-fungible tokens on Ethereum. 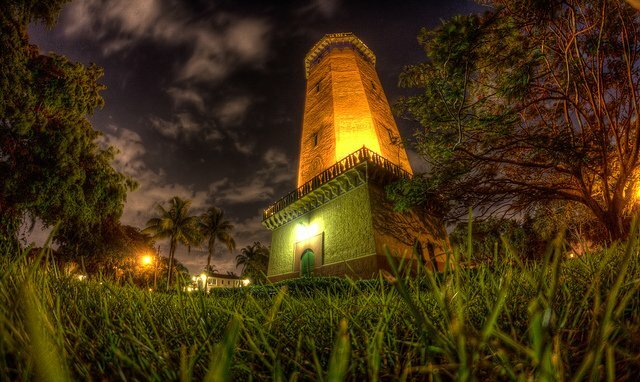 However, unlike many other crypto-collectibles, the Land sold here has both immediate utility in the game and also a collectible value. More interestingly, the land in Lunacia is like regular land in the ‘real world’ in that it also provides rights to assets tied to the land, and the use of that land by others. This means players could decide to passively hold land and still be rewarded by ‘loot’ collected by other players. For a more complete gameplay, check out this post by the team. The additional utility and ability to own and collect assets passively has made Land in Axie Infinity much more appealing to both active crypto and non-crypto gamers, and also regular crypto investors who see the potential of the game and are generally bullish on blockchain gaming. The team also announced the launch of LUNA token, an ERC20 token on Ethereum with utility inside the Axie Infinity and Lunacia ecosystem. By using a token for certain specific in-game assets and actions, the team is better able to control the economics of the game, and balance it with gameplay, while protecting existing players against unnecessary inflation. In addition, the team will give LUNA grants to third-party developers to help grow the ecosystem. The current sale already sold out around 20% of the total within a day. Parts of the land is expected to sell out in a few days, given its scarcity and general interest from the players. 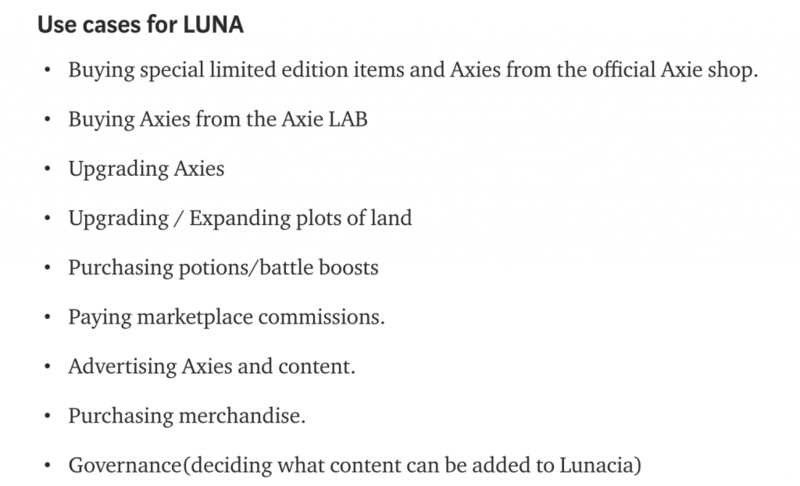 If you buy Land in the pre-sale and use this link, you’ll get 10% of the ETH spent back as LUNA tokens, which you can use to buy land again, or hold on to the LUNA tokens for other uses shown above. Third party tools to play CryptoKitties are a must have whether you’re an experienced player, or new to the game. Being an Ethereum blockchain-based game, there are many tools for CryptoKitties that are independently developed by the players and the community. There are several reasons to use these third-party tools instead of just using the main CryptoKitties website as a player. For one, the CryptoKitties website lacks a whole lot of information when it comes to what you need to know to play and breed well. Another advantage of using third-party tools is to bypass the main CryptoKittties website for breeding. This is essential for regular players since the main website is known to lag behind the blockchain, especially during peak play times (such as fancy chases), making competitive gameplay impossible. 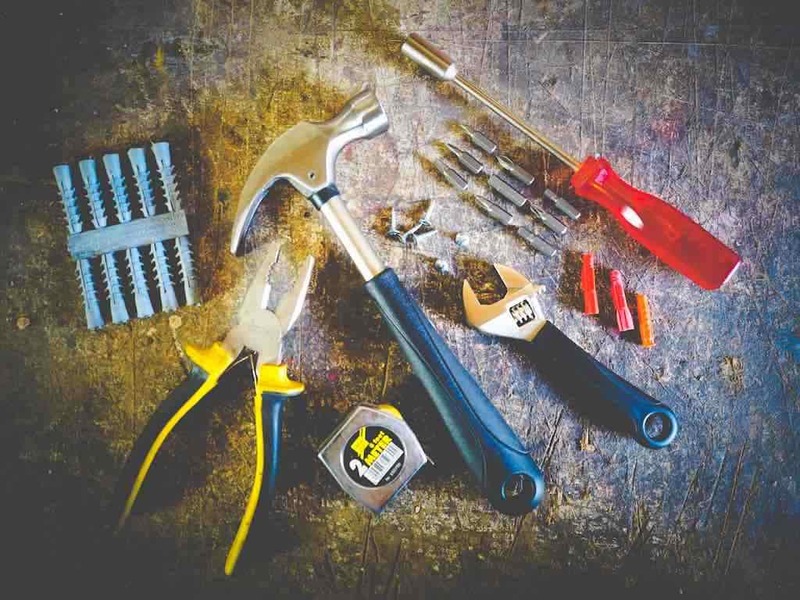 Luckily, many third-party tools have stepped in to fill the gap. Here are some must-have tools for CryptoKitties players. This is probably the single most useful tool you need to really play CK. Believe it or not, it is actually not possible to see recessive genes for your cats on the main CryptoKitties website! To solve for this, you need to install this extension. Once you’re inside a cat’s page on the main CryptoKitties website, you can click to reveal its full set of genes, including wild, environment, purrstige (which again you cannot see on the main CK website). The developers also regularly add new features. For example, today it also shows a full history of the cat, such as previous sales, sires, marketplace listings, etc. In the cattributes page, you can see the full chart of all the mewtations possible with each category. Overall, a must-have extension to play. 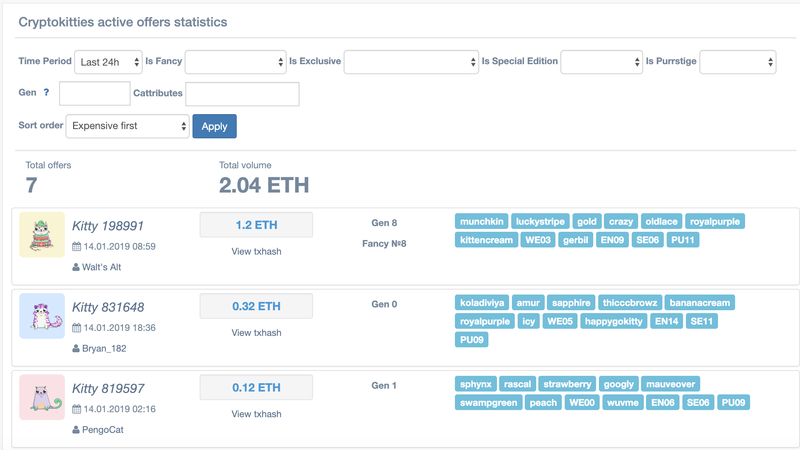 This is quickly becoming a strong tool for searching and breeding, two very important functions that every CryptoKitties player needs, and also functions that are severely lacking in the main CK website. For search, it has an easy to understand way to find recessive/hidden genes. Simply enter the cattribute you’re interested in, and check for hidden genes at various spots (you can select any of the hidden positions – H1, H2, or H3). You can also search for fancies. Here’s an example showing how to search for all cats with Jaguar as the dominant trait, and otaku in the H1 hidden spot. The other tool that heaven.cat provides is a breeding tool. This lets you create and save breeding pairs, and tells you when the pairs are ready to breed again. This is especially useful during fancy chases. You can save all your pairs here, and with one click, breed a pair. An added advantage is the seems to perform well even when the main CryptoKitties website is down or lagging, so you can continue to breed. Kittyexplorer is a super useful website that shows the sales history of the various cats, and a bunch of statistics around the sales data. You can search by time period and by cattributes or fancies. Kittyhelper is a relatively new site that is integrating many of the tools that CK players need, from breeding calculators to price stats. It also has more advanced tools like family jewel search and offers history. Overall, seems like Kittyhelper is aiming to be the one-stop shop for all third-party CK needs. Kotobaza is a Russian language CryptoKitty blog and resource, but also has lots of interesting information for the English speaking community. 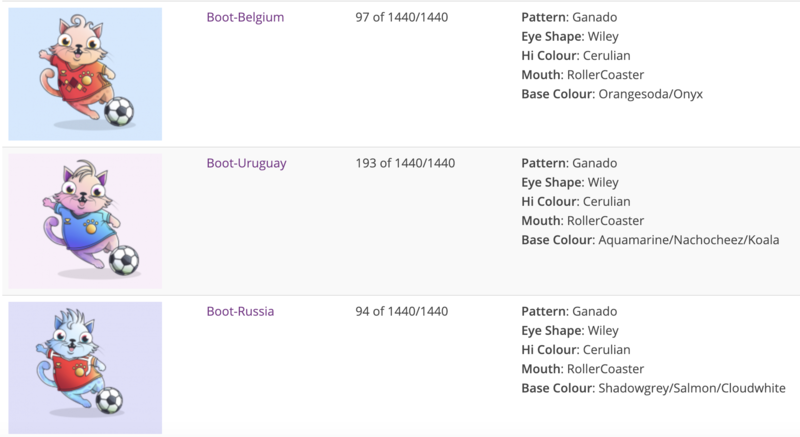 For example, it is one of the only sites where you can see the breakdown of the Boot fancy into the corresponding teams instead of being lumped together as one. This is an interesting leaderboard that has moved the prices of fancies in the past, such as making the low # fancies much more valuable. It shows the different active players and how well they have created their fancy collections, such as completing the full fancy codex. An interesting tool to keep an eye out on the largest accounts as well. There are other leaderboards being added too. 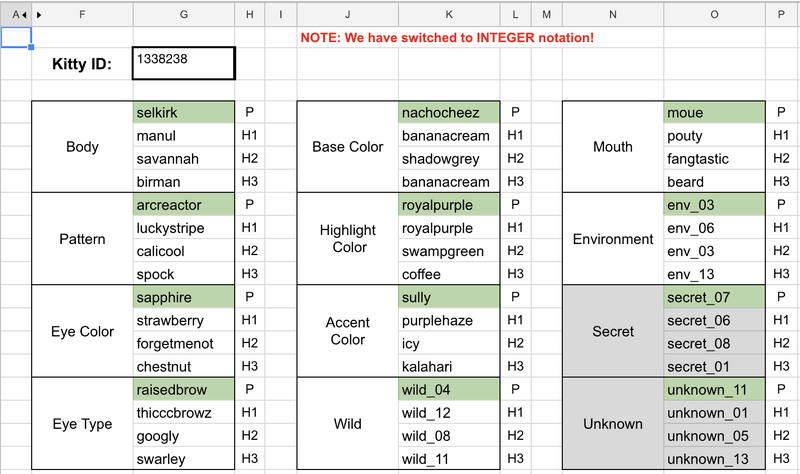 This is a spreadsheet that gives you the full details of a cat’s genes given the ID. It works when the CryptoKitties website is lagging, so it is a handy tool. Finally, let’s not forget Etherscan, the Ethereum community’s favorite tool! It has added support for ERC721s like CryptoKitties in addition to ERC20s. You can enter an address and see the list of all the cats owned by that address. If the CK website is lagging, you can use Etherscan to check for any new cats being born, and use that ID to look up the genes in the spreadsheet above. These are just some of the third-party tools for CryptoKitties players, and there will be many more in the future we are sure. In the future, we hope there are more tools for collectors in addition to breeders. Did we miss your favorite third-party tool? Let us know in the comments below. Taxes are an inevitable fact of life for everyone no matter what one thinks about it. 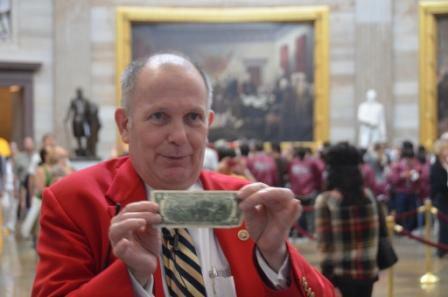 As Benjamin Franklin famously and aptly puts it, it is the only certain thing in the world aside from death. Cryptocurrency miners are not exempt from paying taxes. In fact, the IRS is quick to remind people and businesses who earn from virtual currency transactions to report their earnings in their income tax return yearly as seen in this year’s IR-2018-71. But what exactly do you need to remember when paying cryptocurrency taxes for your 2019 return? Here are some crucial things to keep in mind when dealing with the taxman about your virtual earnings. What Virtual Currencies are Taxed? According to IRS Notice 2014-21, cryptocurrencies that can be exchanged for real currency (such as Bitcoin) are the ones that are taxable. However, these virtual currencies are not treated as currency but as business, investment or personal property. This means that the same principles of issuing and declaring taxable properties apply to your virtual money, according to the government agency. The IRS tax virtual currencies depending on what entity you are (individual or business) or how you acquired it. Payments for goods and services are considered as part of your business or individual gross income in your tax return. Meanwhile, withholding and payroll tax applies if you work as an employee and get wages in crypto money. If you are a cryptocurrency mining hobbyist, successful transactions or activities are covered under your gross income as well. Your earnings are subject to self-employment tax if you do mining as an independent contractor or business. Since cryptocurrencies are treated as property and not as money, filing it as part of next year’s income tax returns can be quite tricky or confusing especially for miners. The fair market value of your mining transactions can also change dramatically. Therefore, it is important to keep tracking all of your transactions within the year to avoid slip-ups in your tax return. Keep all the related information about these transactions as well, as you might need it for your return. Another somewhat complex factor to deal with when it comes to filing your cryptocurrency mining transactions in your return are losses. The IRS determines gains and losses from these transactions depending on whether it is considered a capital asset on your part. 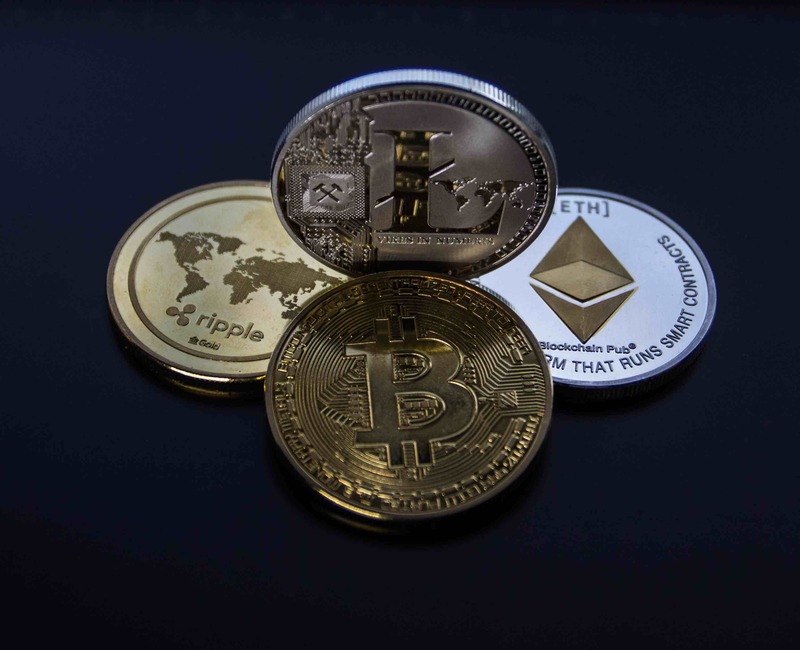 If you have losses on a cryptocurrency transaction that you own for personal or investment purposes, then you might be eligible for a tax deduction. If you’re unsure, it’s best to consult an accountant or tax professional about it. Cryptocurrency taxes are fairly new and a bit tricky to handle as compared to other types of taxes. However, it can eventually be easier to understand and file on your tax return in time. As long as you stay updated and continue to keep a record of all your transactions using effective tools, filing next year’s return will be a cinch. Myrtle is a freelance content writer who specializes in creating unique, high quality content. She usually write articles under taxes including filing tips, planning, and reform; financial health, investments, and healthcare, that aims to educate and provide useful information to her readers. Aside from writing, Myrtle is also fond of traveling and baking. Obelisk—the sister company of Sia that is responsible for producing the coin’s mining hardware—is currently facing a class action lawsuit. The lawsuit alleges that Obelisk failed to deliver on its promises concerning two ASIC devices. In essence, Obelisk’s mining devices seem to not meet the company’s projected performance specifications. According to the lawsuit, two of Obelisk’s ASIC devices are not as profitable or as efficient as the company originally claimed. Those ASIC devices, the SC1 and the DCR1, apparently have not achieved their projected hash rates—800 GH/s and 1500 GH/s respectively. Furthermore, the devices were not delivered by Obelisk’s stated deadline, which was June 30, 2018. A refund is also at stake: David Vorick, who serves as the CEO of both Sia and Obelisk, originally claimed that a full refund would be given to customers if Obelisk did not fulfill its guarantees. However, Vorick later indicated that the company did not have the money to refund every customer. 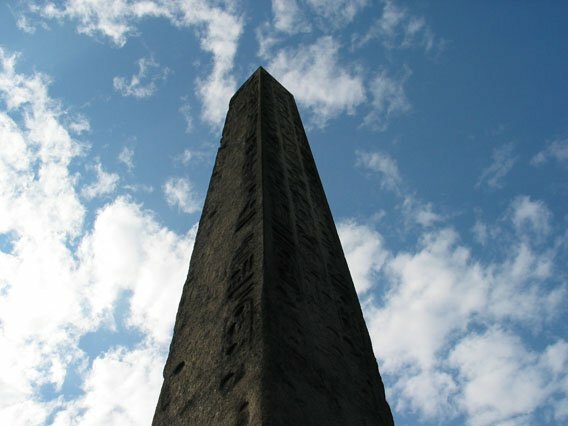 Obelisk temporarily opened a refund process, but refunds have apparently not been issued to members of the class action lawsuit. The lawsuit tackles a very important issue: profitability is a delicate promise in the face of a volatile crypto market and a highly competitive mining landscape. The issue is even more critical due to the fact that Sia had been planning to block competing mining devices—and not simply manufacturer its own—meaning that Sia miners had little choice but to buy their hardware from Obelisk. The Sia community has been calling for a lawsuit for some time, but whether this particular lawsuit has teeth is another matter. Although it seems to get the facts right, the lawsuit has been filed by a very minor blockchain company called UnitedCorp. This company has also filed a lawsuit concerning the Bitcoin Cash hard fork, and it has attempted to sue Facebook over certain patent violations. These two lawsuits seem to be opportunistic, to say the least. It should be noted that this is not the only mining-related lawsuit in recent months. Nvidia recently faced a lawsuit claiming that mining drop-offs damaged the company’s revenue, hurting stock market investors. Bitmain, meanwhile, has been accused of configuring user-owned devices to mine for its own benefit. As it becomes harder to profit from crypto mining in general, it is possible that these sorts of accusations will become much more common. How on Earth do you learn about cryptocurrency? The internet is full of biased opinion on pretty much every single industry, including cryptocurrency. So, guess what? Here’s some more biased opinion on where you should go to learn about cryptocurrency, haha! I say biased, it’s not really since the team over at ICOholder.com have covered a fair few different resources in the infographic below, which hopefully will give you a level playing field of resources to learn from. We don’t all learn in the same way. I remember a million years ago, when I was back in school, if I was expected to learn just via a teacher talking to me, the information used to go in one wax-filled teenager’s ear and straight out the other. I had to be doing some form of writing, whether that was on the back of reading a book, watching a video or just taking class notes. So, if you’re similar to me, perhaps taking one of these cryptocurrency courses will work out for you: The Complete Cryptocurrency Course, Cryptocurrency Trading Course 2018: Make Profits Daily, and Bitcoin And Cryptocurrency Technologies. If only this information was available back in 2013 when Bitcoin went bananas… actually, wait, it was the world that went bananas, over Bitcoin. Satoshi Nakamoto has a lot to answer for; imagine how loaded he, or they, she, it, whatever, would be if they created an initial monopoly on the “how to learn about cryptocurrency” market. Instead, they launched Bitcoin, sat back, laughed at the confusion, and reaped the rewards… how cleverly selfish! Going back to the whole biased opinion side of things, just be careful, especially if someone is offering you investment advice on one of the coins. It could be they’re trying to alter price action in the market, or it could be that they’re trying to promote their own coin. For example, the Bad Crypto Podcast have actually launched their own coin, which is an amazing idea and, while they put out some really useful information, they’ve obviously jumped on the back of this to create their own product i.e. the Badcoin. Either way, Joel Comm and Travis Wright are quite fun to listen to and, if you are attracted to a laid-back style of learning, this can be a great resource. Who knows what the future of cryptocurrency holds, especially with another recent crash in the price of Bitcoin. I don’t actually know why everyone seems so surprised about this, because, quite honestly, it’s not surprising considering the popularity of the niche in general. Surely there’s a level of realization that the more coins that exist, the more competitive the market is and, therefore, prices of coins will drop and stabilize over time? Whatever your take on the market, or how in-depth your knowledge of crypto is, these cryptocurrency resources are an excellent way to expand your interaction with, and knowledge of, the crypto world. 2017’s ICO Success: Sustainable or One-off? The volume of ICOs held steady throughout 2016, rising and falling marginally. However, this was just a warm-up year to the explosion of new ICOs during 2017 Q2. Since then, the volume of ICOs has been accelerating exponentially on a month-to-month basis. Capital flows mimic past ROI trends. If investors consider past ROI trends to have been positive, they are more likely to inject funds into ICOs. On the other hand, if they consider past trends to have been negative, they will either withdraw or shy away from funding new ICOs. According to CoinDesk, capital injection in ICOs in the first quarter of 2018 was 118% higher than during all of 2017. Initially, most funding for blockchain ventures was in the form of equity funding (venture capital). For example, according to Business Insider, in 2016 Q1, equity funding accounted for $17 million compared to ICO funding of only $12 million. In 2017 Q1, equity funding settled at $139 million after a consistent drop, while ICO funding settled at $38 million after a steady rise. In 2017 Q2, ICO funding surpassed equity funding for the first time at $757 million against an equity funding value of $258 million. Whilst equity funding stagnated at $259 million in 2017 Q3, ICO funding shot up to $1.3 billion. Clearly, ICOs have become the preferred investment vehicle for blockchain projects as compared to equity funding. Research, based on historical data provided by CoinMarketCap, shows that ICO funding has overtaken VC funding. This is due to the 16% CAGR (Compound Annual Growth Rate) that ICOs offer investors compared to the CAGR from VC of only 10%. 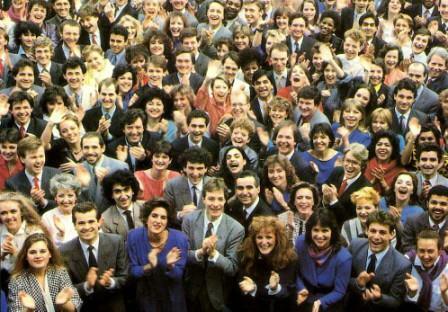 At the beginning of the ICO phenomenon, most investors were small-scale retailers. 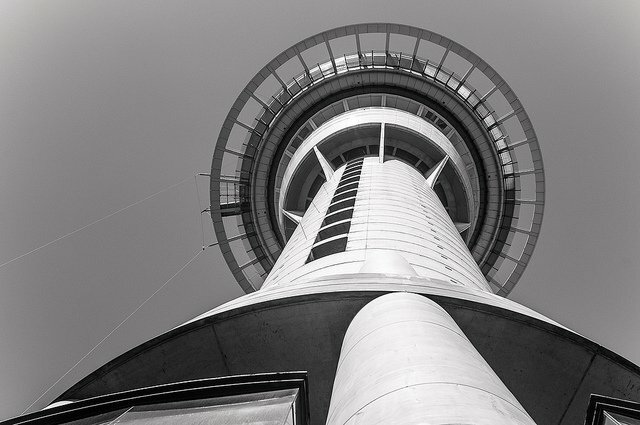 This trend continued into early 2017; however, towards the end of 2017 to early 2018, there was an upturn in the value of institutional investment. As of mid-2018, institutional investors are leading retail investors—not in volume but in value. This is a positive indicator of investor confidence in ICOs. The above indicators point to one conclusion: ICO success is going to continue for the foreseeable future. The ROI picture reflected by the infographic below should be enough to convince any doubting investor that ICOs are worth their consideration. This is an interview with Jeffrey Zirlin on the current state of Non-Fungible Tokens (NFTs), crypto-gaming, and crypto-collectibles. Jeffrey aka Jihoz is an early CryptoKitties and crypto-gaming player. He’s currently part of the Axie Infinity team as their growth lead. As someone involved with multiple games/collectibles in the space as both a player and now working for a startup in the space, Jeffrey has some good insights to share, especially for those who may be new and are looking to understand the current NFT landscape on Ethereum. You can read our interview with the Axie team in the past that is more specifically about Axie Infinity. In the crypto gaming sphere so far, we see an interesting interplay between gamers that want active play and collectors that can be more passive. What’s your take on the right balance here? Gaming ecosystems have had a mix of players and collectors for decades now. In my view, robust collectors markets emerge when you have the right mix of scarcity, utility, and aesthetics around your game assets. We’ve been quite focused on baking as much fun into Axies as possible(utility), while keeping the art quality high(aesthetics) and carefully managing the in-game economy of the universe(scarcity). You’ve been a CryptoKitties player in the past and still own some valuable kitties. What do you think the CryptoKitties team has done right? I think the CryptoKitties team did a good job with the artwork and having the inspiration/conviction to build a product around blockchain game assets without much of a previous demand signal for such a platform. What are the driving factors for CryptoKitties in your view, and are they sustainable long-term? I see CryptoKitties as a probability-driven artistic creation platform on the blockchain. Collectors drive the CryptoKitty market, just as collectors drive conventional art markets forward. The sustainability long term will depend on whether the game can continue to attract collectors with deep pockets– this most likely depends on how this whole experiment in decentralization and cryptocurrencies works out. What types of games do you think would succeed in this space in the future and benefit the most from putting their in-game assets on the blockchain? I believe games in the spirit of Neopets or Pokemon will do best at first. These games will focus on the art style, collectible game-assets, building a strong grass-roots community, and basic but addicting game-play. MMO’s, in my opinion need to scale quite massively in order to be fun, so I think the talent and funding needed to pull one off are still years away. When building Axies, how important is it for your team to have third-party developers build tools and additional uses for Axies? Right now we have some amazing third party developers building analytics tools for Axie and they’ve helped so much with lightening the load on the dev team to help us focus on core gameplay. Freak, Onedayplay, and Uselessz have built two great sites that I use on a daily basis. In addition, we are starting to see mini-games pop up that are serving as interesting content marketing tools for our game. For example, https://flappy-axie.herokuapp.com/ has been a fun way for our community to stay immersed in the Axie universe while they wait for their battle cooldowns to refresh and introduce new players to our artwork since the game does not require an Axie to try out. What are the most interesting trends in your opinion with respect to the collectability of these NFTs, as the space has evolved? I think it’s amazing that sale prices in some of the popular games are starting to rival the prices we see in Mainstream games like Magic the Gathering. For example, an Axie recently sold for 50 ETH, over $10,000, so prices are well on their way to eclipsing what we’ve seen with collectors items like the Alpha Black lotus from Magic the Gathering. What advice would you give someone looking to enter the crypto-collectible/crypto-gaming space today in terms of how best to spend their money? I think players/collectors should focus on analyzing the quality of artwork, the “fun” that the platforms for the specific NFTs provide, and making sure you are investing in a project that has a strong grassroots community of evangelists, hobbyists, and content creators..
Are there other games or use cases of NFTs that interest you today besides Axie/CK? I’m interested in seeing how Loom Netowork’s Zombie Battleground app does as that will be a major testing point for the space and also provide some clarity around regulation around apps involving NFTs. We’re already seeing an explosion of new games modeled after CK/Axies, and some are already shutting down or not performing well in regards to player activity. What does it take to survive and succeed in the long term in the space? I think most of the games that have tried to replicate our success have made half-hearted attempts and lack the development speed, art quality, and strong community we’ve been able to cultivate. There are no shortcuts to success in this space and I think now that some of the early games have proven there’s a market out there for these types of games, some less talented actors are trying to enter the space. The big game studios are still sleeping at the wheel, content with their current business models. You were an early pioneer with CryptoKitties gameplay. What’s your quick pitch to a CK player to give Axie Infinity a spin? Axies are the first fully animated NFT’s with an engaging, animated battle system on the Blockchain. Also it only costs .002 to breed your Axies, so your creative juices can flow freely! In addition, battles are completely free. The joy of breeding that perfect battler for your team is something I believe has eclipsed the thrills I used to experience in the Kittie universe. Are you experiencing a slow Metamask and looking to speed up Metamask while your browse the decentralized application (DApp) world? This guide will walk you through all the steps to get it up to speed. Metamask has become a staple of the DApp ecosystem on Ethereum. It lets you interact with the Ethereum blockchain via a browser extension. This is really convenient as you don’t need to download Ethereum node, connect hardware wallets, or download other software. As a simple extension, it really is a browser’s gateway into Ethereum’s DApp world. Metamask is available for Chrome, Firefox, and Brave browsers. But there is a big problem with Metamask – it gets really slow for power users. After a while, it seems to be taking longer and longer to load a transaction and send it to the network. When does it happen? It happens when you submit many transactions. This is especially the case for crypto-gamers that play games like CryptoKitties, Axie Infinity, Gods Unchained, etc. since they submit many transactions. For example, CryptoKitties players in aggregate birthed over a million cats so far, each birth recorded on the Ethereum blockchain! Those are large numbers. If this describes you, here are the action items that you can take now to speed up Metamask. Hopefully this makes your crypto-gaming experience smoother. The very first thing to do with a slow Metamask account is to remove the transaction history. As the number of your Metamask transactions increases, your Metamask becomes slower. I think most users have already noticed that. If you have many transactions, the first thing is to ‘remove’ all these transactions. 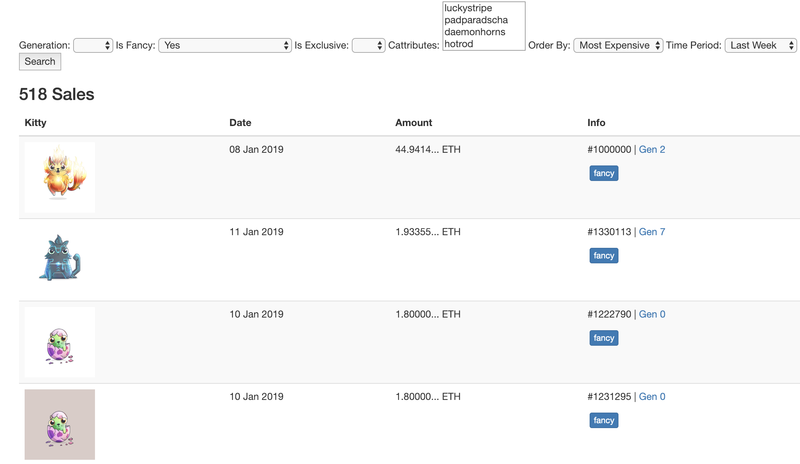 Since all your previous transactions are already sent to the Ethereum blockchain, there is no need to keep a history in your local Metamask. 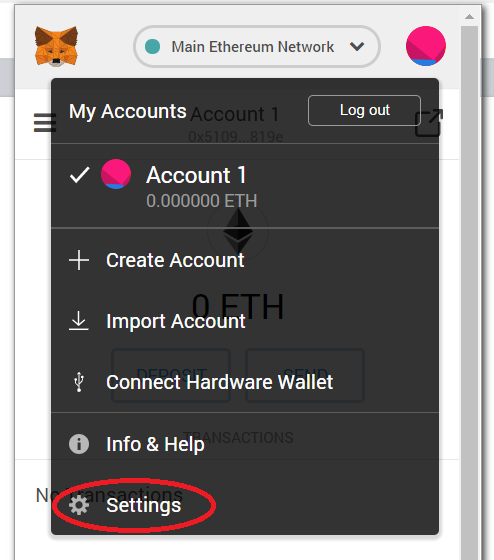 How to reset Metamask Account? First, click on your Metamask plugin to open the app. Below is how it appears on Brave. It is similar in Chrome and Firefox as well. When the app opens, click on the circle on the top right corner of the app to display a menu. 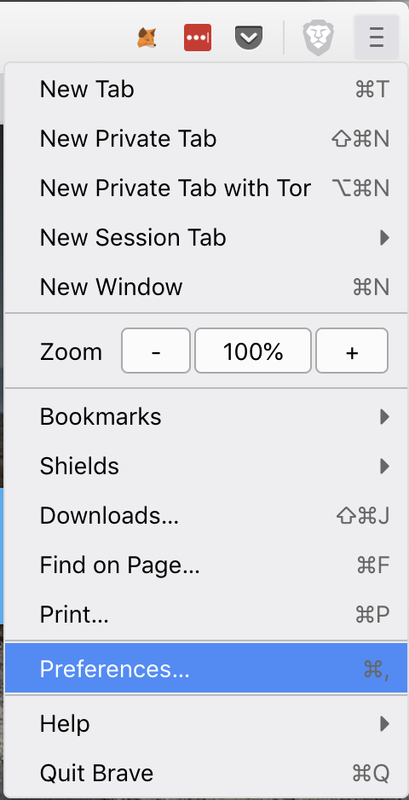 From the menu, click on the Settings at the bottom. 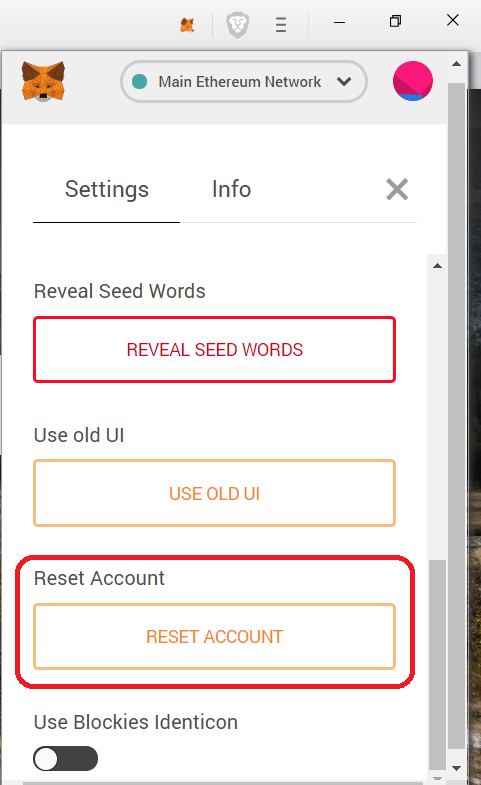 Scroll to the bottom of the Settings, and you’ll see an option for ‘Reset Account’. Click on this button. Metamask will ask you for a confirmation, along with telling you what exactly this ‘Reset Account’ feature is. 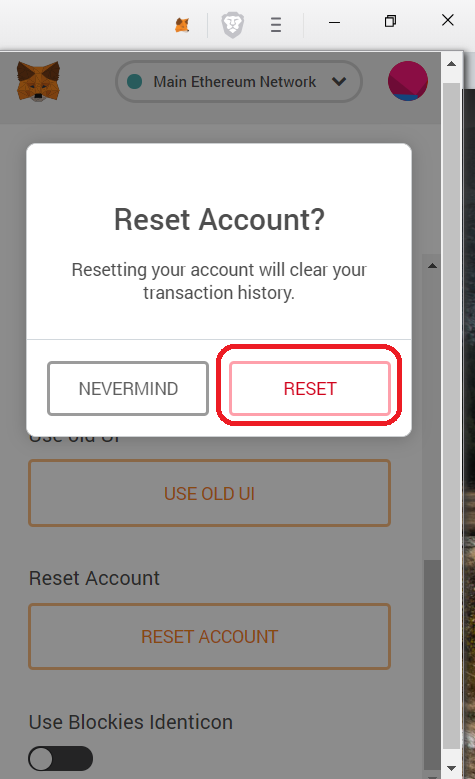 “Resetting your account will clear your transaction history.” Click on the RESET to confirm. This will remove your transaction history and make Metamask run much faster. After you’ve done the reset account, you can try this other trick for slow Metamask. You will need to switch the network that your Metamask connects to. Don’t worry – you’ll change it right back to the main Ethereum network. First, open your Metamask in your browser as shown above, and click on the dropdown at the top of the app that says ‘Main Ethereum Network’. 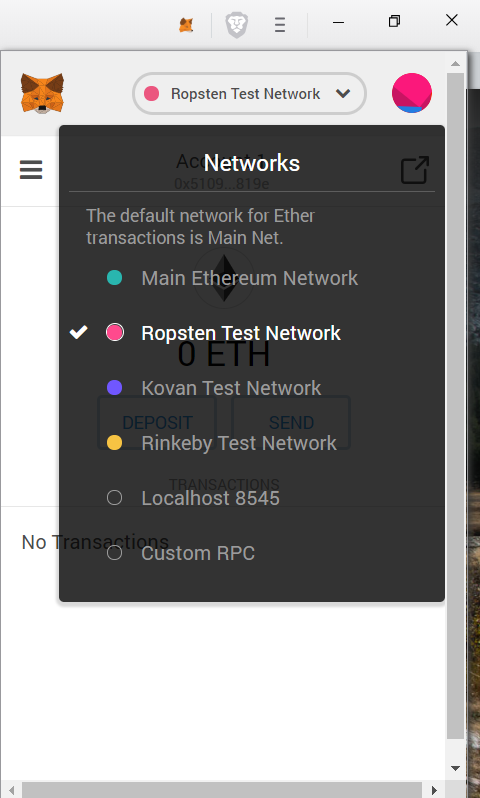 Now change this to another option, such as Ropsten Network. You’re telling your Metamask to connect to a Ropsten node now instead of the Mainnet Ethereum. After this, switch back to the ‘Mainnet Ethereum’ option to connect back to the mainnet Ethereum network. This step ‘resets’ your Metamask connection to the main Ethereum network. It helps with, for example, flushing your transactions. You may have noticed for example that sometimes Metamask doesn’t tell you that the transaction has been confirmed. This step will force Metamask to recompute the transactions and give you a notification for when your transaction has been broadcast. Some DApps like CryptoKitties also recommend this step for some errors on their application. This is a handy little trick to not only speedup your Metamask but also update its state. In your browser extension/add-on section of Options/Settings, disable and then re-enable Metamask. This will likely ask for your password again, so make sure that you have your Metamask password handy. This step is helpful to ‘reload’ the Metamask extension, and helps speed up Metamask by restarting it, thus getting rid of its current state and restarting. Then go to Extensions on the left side, where you’ll see Metamask installed. Under the ‘enabled’ column, disable (just click to disable) and then re-enable Metamask. Note that when you do this, you’ll be asked to enter your password again. Make sure you have that handy before trying this step. Sometimes your browser can take up an ungodly amount of memory on your RAM. Chrome is especially notorious for this. In these situations, Metamask will slow down as well. The best solution is to close your browser and re-open it. Make sure your browser settings are set to re-open all your sites, so you don’t lose your tabs when you restart. When you do this, you will be asked for your Metamask password again. 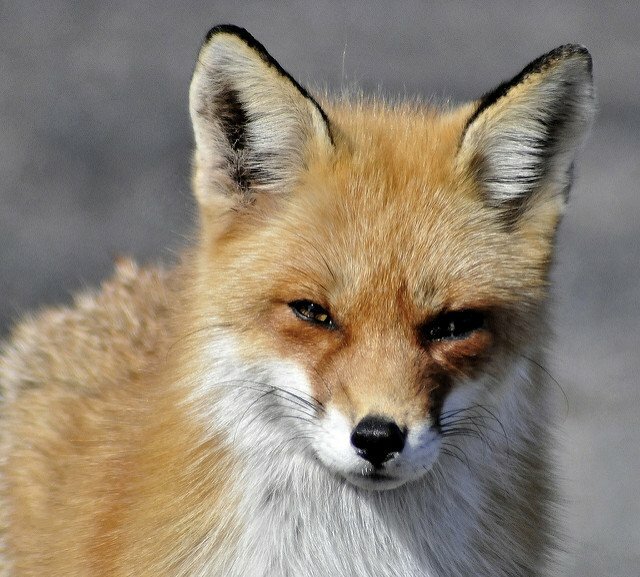 In general, freeing up some computer RAM will make your Metamask faster as well, so close any large programs that you may not be using, especially browsers running in the background. As a final step, Metamask is available for Chrome, Firefox, and Brave currently. Try switching your browsers to make it faster. You can also exclusively use one of the browsers for all your DApp needs, and use another for regular browsing. Hope at the end of this, you’re able to solve your slow Metamask issue. If not, feel free to leave a comment and we’ll try to help. Gods Unchained is a new blockchain-based trading card game. It follows the tradition of classic Trading Card Games (TCGs) like Magic the Gathering combined with crypto-collectibles and games like CryptoKitties. Combining them provides a powerful recipe where the result is greater than the sum of its parts. Already, the most desirable card was put for auction that fetched a cool 146 ETH or $60,000. That’s before the game was even launched. Welcome to Gods Unchained. The cards in the Gods Unchained game are represented as a Non-Fungible Token (NFT) which means unlike a cryptocurrency that aims for fungibility (all units of the currency being equivalent), the tokens here are unique and different from each other. Therefore, each card is somehow different from the every other card in the game and this can be shown on the blockchain. The data stored in the NFT is then used to provide the appropriate look and functionality for the cards inside the game. Before we dive deeper, let’s first answer the question that is probably one we get the most often on this blog – why crypto? What benefits does the blockchain provide over a SQL database, as the question goes? The answer in the case of Gods Unchained and similar crypto-native in-game assets is quite simple – with the blockchain, you have true ownership of your assets in the game. In the case of Gods Unchained, this means you own your cards completely. Once you acquire a digital card in the game, it is truly yours. No one, not even the team behind Gods Unchained can prevent you from trading that card, for example. The dynamic becomes similar to physical cards in a game like Magic The Gathering. 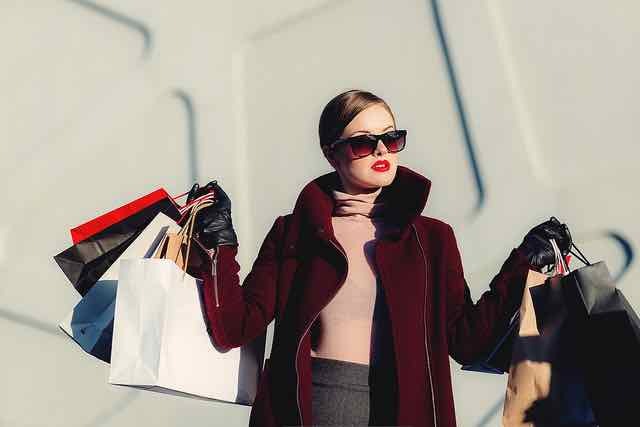 As some of these assets can indeed become quite valuable in the future, having them on the blockchain means collectors know they truly own these assets. It is not just another entry in a database of a startup. Gods Unchained has everything gamers aspire to. The game has various strategic elements where players need to apply skill (i.e. it is not just random chance). Also, the game visuals are stunning – just go check those out yourself to be the judge. The game is free to play for the basic cards, so accessible to really anyone with an internet connection. Players compete from around the world in a very real sense. For any advanced cards, players truly own their assets in their Ethereum wallets – not even Gods Unchained team can take that away from you. There is a precedence for a healthy secondary market for these digital assets that players can use even after launch. Then finally there is real tournament play, with 20,000 tickets already sold out. The pot for the tournament currently stands at around $350,000. That’s real money with real players right there. If you’re a trading card game enthusiast, you’ll probably love what Gods Unchained has to offer. We already mentioned the killer graphics, but there is much more to the technology behind the Gods Unchained game than meets the eye on the website. We’re talking about the blockchain for gameplay of course. There are various schools of thought here, but in our opinion, Gods Unchained strikes the right balance between on-chain and off-chain elements. This is because blockchains are not yet ready for prime-time scalable applications. We’ve seen that play out in games like CryptoKitties that can become popular and cause an Ethereum network wide congestion, driving up costs to play to significant levels. In Gods Unchained, the gameplay is offline on centralized servers. This means if there is a popular ICO going on, then players don’t need to wait for 2 days for gas prices to normalize. Also, playing can be free and not pay a huge amount of money to the miners. However, the assets are still held on the blockchain in your personal wallet, so the rare cards are not sitting on a central server somewhere but under your ownership. The team behind Gods Unchained already has some experience with this – they were the team behind Etherbots, which caused a stir during release but died down due to expensive on-chain gameplay. The team seems to have learned the lessons from that well, and implementing it in their technology behind Gods Unchained. The VCs are quite interested in the whole NFT space. CryptoKitties raised $12 million from the top venture capitalists in the world – Union Square Ventures and Andreessen Horowitz among others. Marketplaces like Rarebits and OpenSea have raised over $1 million to create marketplaces for all sorts of NFTs. Fuel Games has already raised a $2.4 million venture round. In addition to venture funding, the company has sold over $1 million in pre-sale cards already, and still counting. This is all raised from real players who are interested in participating in the game, not just institutions. This really shows that players are ready to invest not just their time but their money into the game. Check out Gods Unchained here. You can still buy pre-sale cards right now.